When it comes to proficiency, experience and product scope within the field of hygienic centrifugal pumps, it's hard to find a better partner than BEECO. With decades of experience in centrifugal pump design, BEECO carries premium brands such as APV and Waukesha Cherry-Burrell enabling us to offer you a wide range of pumps for any processing application. Efficient, dependable and unobtrusive; our pumps can help you cut production costs, reduce equipment breakdowns and ensure product integrity. For aseptic flow applications, centrifugal models are available that retain the benefits of the Waukesha Heavy-Duty Centrifugal Pump, but also include a special design feature that protects the product zone against contamination. The Heavy Duty Metric 200 Series pump is designed for heavy-duty, high-efficiency applications. This pump provides exceptional corrosion resistance. High Pressure 200 Series Pump comes equipped with a balanced double shaft seal and buffer fluid ports on top and bottom, which allows for complete removal of air and/or vapor from the seal chamber. 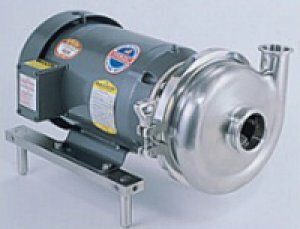 Designed for use in the Bio-Pharmaceutical industry, these pumps are manufactured to meet ASME BPE specifications and criteria. The Heavy-Duty Sanitary Centrifugal Pump is designed for heavy-duty, high-efficiency applications. It provides exceptional corrosion resistance. Specifically designed for re-circulating services in a reverse osmosis system and other membrane systems. Designed for heavy-duty and high-efficiency applications. The Metric Heavy-Duty Sanitary Centrifugal Pump provides exceptional corrosion resistance. The Multistage High-Pressure Centrifugal Pump is specifically designed for re-circulating service in reverse osmosis and other membrane systems. The PUMA+ is ideal for standard applications in the brewery, beverage, food and dairy industries. The Self-Priming Centrifugal Pump is not only an excellent CIP return pump, but the 200LR can run in either direction. This makes it possible to fill or empty tanks using the same pump. The APV model V² Centrifugal Pump is a simplified and maintenance-friendly centrifugal pump. Proudly featuring a four-blade, fully open, non-clog impeller. W+ has a comprehensive range of premium sanitary end-suction centrifugal pumps, designed with maximum operating benefits and minimal life cycle costs in mind. Although this pump is designed for high purity, pyrogen-free fluid, used in pharmaceutical products, this pump is ideal for pumping high purity, deionized water. Adapted from the rugged precision of the 200 Series designed for pumping water for injection.